Sometimes pet owners need help with dog walking. Wayland residents know they can count on the one-on-one attention offered at Doggy Dates. We’re serious about the work we do, and keeping your dog happy, active, and healthy is part of it! When you choose to work with our service for dog walking in Wayland as a client or a playdate supervisor, you’ll love the atmosphere, the care, and support, we put into our mission. Seeing a happy, tired, and obedient dog at the end of the day is worth it! Learn more about our services. Our playdate supervisors and overnight hosts are passionate about dogs. We believe unconditional love plays a crucial role in our ability to care for our clients’ pets. Our supervisors and management team come from a wide variety of backgrounds, but we all have experience raising four-legged friends, spending time with them at shelters, and helping rescues live their best lives while waiting for their forever homes. We’re not your average dog walker in Wayland. We’re a team of professionals who care about what you and your dog think about our service at the end of the day. We put your dog’s health and wellness first. As an insured, professional organization serving a number of clients, we take certain precautions to protect the health and wellness of each pet we support. Every client undergoes an application process. We require current vaccinations for every pet we watch over, regardless of which services we provide. We also evaluate the demeanor of every dog we allow to socialize in a group setting for the safety of the group. If your dog does not do well in certain settings, honesty is the best policy. As your resident dog walker in Wayland, we strive to accommodate all of our clients, but we do set boundaries if we believe doing so will protect our existing group members. We provide socialization in a natural environment. A typical dog walker in Wayland may only offer a short walk around the neighborhood. Many traditional doggy daycares only provide a small amount of space for your dog to run and play. Our company has access to an acre in the countryside where your dog can socialize with others, run, and expend his or her energy before coming home. Even More Reasons To Choose Us For Dog Walking Wayland! If you’re searching for a truly enjoyable experience for your dog, consider one of the only doggie day care facilities that lets your dog enjoy the great outdoors. Doggy Dates rates are competitive. When our guests consider our value and convenience as more than a dog walker in Wayland compared with typical pet care, they realize the value our service offers. When we take your pet for a playdate or an overnight visit, we make sure your pet has access to a homelike environment and an outdoor play experience. When it comes to dog walking in Wayland, you won’t find a more competitive offer in all of Boston. Our team can keep an eye on your pet while you’re away. In addition to group playdates, we offer overnight services. Instead of keeping your pup in a large kennel, we will invite your furry companion into one of our professional’s homes for a true home away from home experience. 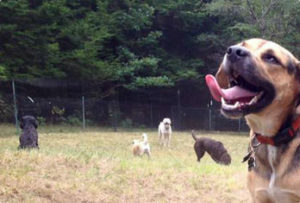 Doggy Dates is much more than you would ever find from a typical dog walker in Wayland. You will have the opportunity to speak with your overnight host and make the final decision, but our overnight guests typically feel right at home with their host families. Browse our gallery to see what we mean! Interested in becoming an overnight host in your search for dog walking jobs in Wayland? We’re constantly on the lookout for enthusiastic dog lovers in the 01778 who can demonstrate a professional ability to care for canines during longer visits. We offer free trials! As anyone who works with animals knows, pups have their own quirks, just like humans. Let your dog interact during group play, get to know our staff members, and see if we’re the right fit for you. Use the free trial to explore our business practices and see that tired, but happy smile on your fur baby’s face (you know the one)! We know you’ll fall in love with our transparent business practices and our ability to serve as your go-to service for dog walking in Wayland and much more. We have a fleet of puppy mobiles! We serve many clients who take advantage of our play group sessions scheduled three times a day, every day of the week. To maintain flexibility and keep our scheduled playdates, our doggie chauffeurs use a fleet of company-branded Scion XB’s with individual compartments for each guest. We can pick up your pet and drop him or her off, even if you’re not home. Can another service for dog walking in Wayland do that? Our team is as flexible as you need during the workweek and on weekends. Contact us to take advantage of our personalized service menu today! We know choosing a dog walker in Wayland takes time and research. Allow us to show you our unique approach to dog care, and we know you’ll love entrusting your dog to us day after day. For more information about dog walking and dog walking jobs, Wayland residents can contact us at (781) 801-2526.